Last week was my almost-husband Andy’s birthday and this was his cake. From the moment I saw the Momofuku Milk Bar Cookbook and I flipped past this gorgeous, sprinkle-laden cake, I knew it was worthy of a special birthday. Since my turn to pick the recipe for Milk Bar Monday coincided with my fiancé Andy’s birthday, I knew this was the cake he was getting. I mean, how could I not make him this cake? 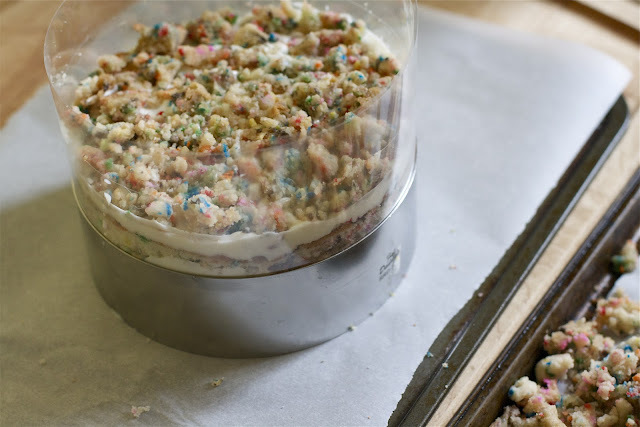 Christina Tosi aimed to create a replica of the classic funfetti boxed cake that she remembers from her childhood. Even though my Mom never made it, I remember adoring when classmates brought in fluffy funfetti cupcakes with creamy canned frosting. The thought of making a similar cake but from scratch seemed like a dream come true. And it truly was. This cake was everything I had dreamed of and more. The cake itself was soft and fluffy, the frosting was creamy and perfectly sweet, and the crunchy birthday cake crumbs layered in between added the perfect contrasting texture. Andy feasted on this cake, and everyone else that tried it agreed it was the perfect nostalgic comfort food. The one change I would make next time is to make a bit more frosting. It was so delicious and I ended up a little short. So basically- eating little mini bites of cake scraps slathered in frosting before you make the cake isn’t a good idea..you’ll need every last drop! Invert the birthday cake onto a sheet of parchment paper or silpat, and peel off the parchment paper backing. Using the 6-inch cake ring, stamp out two circles from the cake. These will be the top and middle layers. The remaining cake "scrap' will come together to make the bottom layer of the cake. Clean the cake ring and place it on a sheet of parchment paper or silpat atop a baking sheet. Use one strop of acetate to line the inside of the cake ring. Put the cake scraps in the ring and use the back of your hand to press the scraps together into a flat even later. Dunk the pastry brush in the birthday cake soak and give the layer of scraps a good, healthy bath of half of the soak. Spread one fifth of the birthday cake frosting over the base layer. Then sprinkle with one-third of the birthday cake crumbs evenly over the top of the frosting. Use the back of your hand to anchor them in place. Top with another fifth of the birthday cake frosting, carefully spreading it so that it is even, but without disturbing the crumbs. With your index finger, gently tuck the second strip of acetate between the cake ring and the top ¼ inch of the first strip of acetate, so that you have a clear ring of acetate 5-6 inches tall- high enough to support the height of th finished cake. Top with a full circle of cake (save the nicest one for the top layer), brush the rest of the cake soak over this layer, top with another one fifth of the frosting, one third of the cake crumbs, and another one fifth of the frosting. Nestle the remaining cake round into the frosting. Cover the top of the cake with the last fifth of the frosting. Give it volume and swirls, or opt for the perfectly flat top. Garnish the frosting with the remaining birthday crumbs. Preheat the oven to 350. Prepare a rimmed quarter sheet pan by spraying with cooking spray and covering the base with a sheet of parchment. Set aside. Whisk together the flour, baking powder, and ¼ cup sprinkles in a small bowl. Set the dry ingredients aside for later. In the bowl of an electric mixer fitted with the paddle attachment, cream together the butter, shortening, and sugars on medium-high speed for 2 to 3 minutes, scraping down the bowl as needed. Add the eggs (all at once) and then beat again on medium-high for another 2 to 3 minutes. Scrape down the bowl. With the mixer on low speed, add the wet ingredients (buttermilk, canola oil, and imitation vanilla) in a steady stream. Increase the mixer to medium-high speed and beat for another 4 to 6 minutes. The mixture should double in size and turn practically white. Don't stop mixing until the mixture is completely homogeneous, with no visible streaks of oil or fat. With the mixer on low, add the dry ingredients, and mix for another minute or so until the ingredients are just combined. Pour out the batter into the prepared sheet pan, spreading it out into an even layer. Sprinkle with the remaining 2 tbl of sprinkles. Bake for 30–35 minutes until the cake bounces back slightly when gently pressed in the corner. The center of the cake should no longer jiggle when the pan is shook. Cool the cake completely in the pan on a wire rack. Whisk together the milk and vanilla in a small cup or bowl. Preheat the oven to 300 and line a baking sheet with a Silpat or piece of parchment. In the bowl of a stand mixer fitted with the paddle attachment, combine the sugars, flour, baking powder, salt, and sprinkles. Mix on low speed until combined. Stream in the oil and the imitation vanilla on low speed and continue beating the mixture until the ingredients clump and form small clusters. Carefully spread the clusters in a thin layer on the prepared baking sheet and bake them for about 20 minutes, breaking up occasionally. They will be slightly moist but will harden as they cool. Let them cool completely before using. In the bowl of a stand mixer fitted with the paddle attachment, cream the butter, shortening, and the cream cheese for 2 to 3 minutes on medium-high until the mixture is smooth and fluffy. Add the glucose, corn syrup, and vanilla, and beat the mixture on medium-high speed for 2 to 3 minutes or until the mixture is smooth and glossy white. Add the powdered sugar, baking powder, and citric acid on low speed until just combined. Crank the mixer to high speed and beat for 2 to 3 minutes or until the mixture is stark white and fluffy. That is soo impressive! It actually looks soo delicious!! Audra, what a BEAUTIFUL cake. I saw it posted on Cassie’s page and I just had to check out the recipe and pictures here. It looks beautiful! That birthday cake crumb has me going nuts. I bet it would be delicious as a topping for frosted funfetti cupcakes. Tosi’s recipes all look very labor intensive and hard work, but the end results are gorgeous. Love your pictures. This cake is breathtaking. I’ve been a little intimidated by that cookbook, but seeing the results I have to give it a try! Wow, that’s an ambitious cake project! Looks like it turned out great :) I think the first picture of the cake is one of my favourites you’ve ever done! I want this cake on my birthday. It looks YUMMY! Happy birthday to Andy! My hubs’ was last week too. We celebrated with this cake and it was the best ever. Thanks for picking this one, definitely a favorite!! Your photos are stunning too! I seriously am in love with this cake! It is soooo pretty & delicious! Sprinkles are some of my favorite things ever… I’m obsessed! Yours is gorgeous! This cake is absolutely stunning! I love it! This has to be the most amazing cake I have ever seen! I like the Milk Bar Blueberry and cream cookies, but my beef with Tosi is all her recipes take awhile to make since they are mashups. You have to make so many things in advance like milk crumbs etc. I do wanna try this especially because I had the birthday cake truffles the last time I was at the Milk Bar in the East village. I agree that they take awhile, but so far they have always payed off! Some of the best things I’ve tried! Aw thanks Erica! I got a new lens and it is making such a change in my pics! Thanks so much Sally! yes- that crumb is addicting! Your cake turned out SO pretty, Audra! I especially love the pic of Andy holding his slice. Happy birthday, Andy!! I just can’t even focus on anything other than this cake today. “Birthday cake soak? !” “Birthday cake crumb?” YES!!! PLEEEEEEASE! BEAUTIFUL!!! My goodness everything about this post is perfect. Great pick for this week! Brava! This looks so crazy good, Audra! I think I’ll have to make up someone’s birthday just so I can make it! ;) Thanks for sharing. This is the most amazing cake I ever saw. Love it! Will def be trying this one! I am so glad you picked this recipe, it was fabulous! I think I am going to make it for all birthdays from now on. Deeeelish. Would love to make this cake as one of the desserts for my daughter’s wedding. Question: Can this cake be frozen? And if so, for how long? Thank you. can you just do this cake in 3 round cake pans instead of a sheet? oh my it looks just like the book!! so so pretty! Birthday cakes come in all shapes and sizes, from numbered birthday cakes through to more traditional box shaped birthday cakes. Can you share a link for the acetate you purchased? I’m having a hard time figuring out if I’m finding the right thing on Amazon! Also- some of my other MBM friends had success using clear transparency sheets cut into strips! what size cake ring do you use? That is so beautiful! Bet it’s delicious as well! I am very excited I found this recipe and am planning on making it this coming Sunday for my daughter’s first birthday! However, I am finding it hard to find the citric acid and glucose. Any help?! Thanks!!! I’m so glad you liked it! Lots of work but worth it right? Absolutely! I’m going to attempt to make red velvet cake crumbs this weekend. I want to make this cake but it seems so difficult! Maybe some day I’ll make them! 1. I couldn’t find acetate at walmart or target so I ended up using posterboard. It worked fine. 2. I made a simple cream cheese icing instead of all the glucose/etc. This was also easy, not quite as bright white but that might be because the shortening I used was colored (see next comment). 3. I had some butter flavored shortening which had yellow dye in it to make it look like butter. I didn’t get the bright white =( but it still tasted good. 4. My sprinkles bled! Don’t buy the Walton brand for this, they turned my supposed to be bright white cake into something greenish. 5. I made some “big” crumbs to put on the top in a circle. I saw this somewhere on the web and I think it looks a lot nicer than dumping them all in the middle. This is the 2nd time I’ve made the cake and I can’t get it to rise as much as yours.. Nothing I’m using is expired and I used cake flour (but homemade)… Do you know what it could be? First off, I love the way you go through this recipe! it is very thorough and the photos are awesome! Secondly, I just attempted this cake and I am having a bit of trouble with the Cake Crumb! When I add the wet ingredients to the dry, low speed on the mixer, it doesn’t seem to clump up at all and does not form small clusters! Is there something I should be doing to make this happen? I’ve had to add more oil and that somewhat helps, but otherwise, I have to form the clusters by hand :/ Hoping you had some advice on how to make the crumb! I’m wondering why she uses imitation vanilla instead of real vanilla extract. Any ideas? I just looove how perfect this cake is! ✨ I just wanna ask, do you need to cover the cake with cling wrap upon freezing?